I think the relationship you have with Mrs. (removed) is not right. You guys fight. Ms. (removed) is a nice person. So are you. I think you should find somebody who you do not argue with. I am just showing my feelings. Please think it over! (LOVE). It’s so loving and level-headed, and fair to all the parties involved. 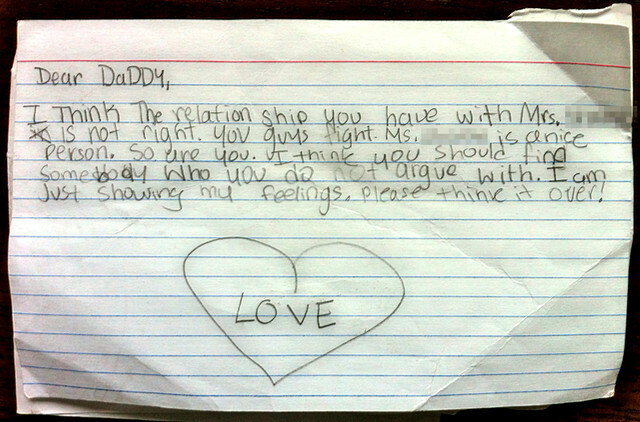 I especially love that the little girl (I’m guessing) that wrote this is not taking sides. The only thing that would make this more adorably precocious is if she had added “Daddy, I understand that you have needs, but this is not a healthy way to address them.” Here https://www.caladrius.com/buy-viagra-cheap-generic-online/ you can compare prices for generic Viagra, compare delivery methods, payments and choose the best offer. I can think of a few instances in my life when a note like this would have really been a welcome wakeup call. Although if this piece of advice were all that welcome, I probably wouldn’t have found it on the floor of the subway station.